The Internet is running short of cat videos. We need more. Urgently! Catisfactions, also known as Temptations (North America) or Dreamies (Northern & Central Europe, Russia, South America), offers a selection of delicious cat treats with a crunchy outside perfectly balanced with a soft irresistible center of meat, cheese or fish. It is so irresistible that cats have been known to do everything to have their treats, like attack the pack to get hold of the precious treats. 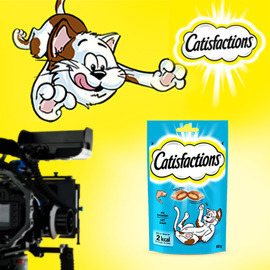 Catisfactions has launched a successful advertising campaign showing empty torn packs in posters to prove that cats go nuts to get to their favorite treats. We need your help to bring that idea to social media with hilarious cat videos. In a fun & playful video, show us what happens when an impatient cat decides to take matters into his own paws and attacks a Catisfactions pack. Format: Video up to 45 seconds. Entries are accepted till February 07, 2016 23:59 UTC! Good luck!